Click here to view Apex Masonry Trendstone website. Click here to view Big Wall Builder's jobs using Trendstone products. Keppel Coast Paving and Big Wall Builders use many of Apex Masonry products. 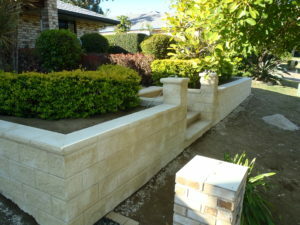 Apex Masonry's diverse range of Landscaping products cater to every design scheme. Whether you are creating a stylish contemporary space or you prefer a traditional look, the range will inspire and stimulate ideas to make your outdoor living design a reality. This range delivers a mixed style of colour, structure and functionality. From naturally simple garden edges to decorative retaining walls, small format pavers to large stepping stones, the variety of options provides everything you need to enhance your outdoor living. Trendstone comes in a Wall unit; Corner Unit; and Cap and a variety of colours. The Trendstone range comes in Fraser Sand; the Standard range comes in Pebble and Charcoal. The Designer range comes in Fraser Sand, Fraser Coral and Ivory. Since 1979 Apex Masonry has been delivering high quality masonry products. They are an Australian owned company which manufactures and supplies building and landscaping products direct to Queensland customers and contractors. They have over twenty years of experience in producing garden edging, pavers, retaining walls, grey block and designer blocks that fulfil a variety of landscaping needs. There are various different colour finishes to create a classic or contemporary look with architectural coloured blocks. Apex Masonry Trendstone products are suitable for steps, corners, straight walls and curves. Phone Keppel Coast Big Wall Builders for a free quote on your project and Duwayne will be happy to assist you in any way. Duwayne's phone number is 0412 581 081.